Accommodating from 2 to 6 guests in her three guest cabins, the 2008 Leopard 46 is great for three couples or a family party. 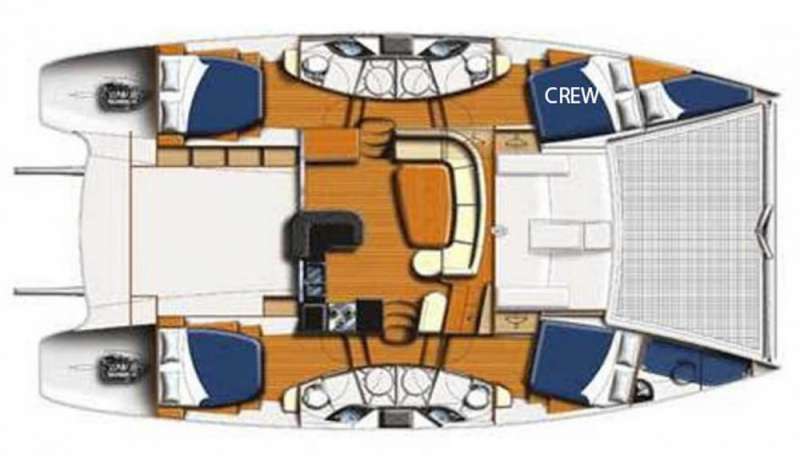 The catamaran boasts a spacious covered cockpit area with comfortable seating for six around the table and additional seating to the side of the cockpit. The raised helm station allows the captain to handle all navigation and sailing tasks out of the mix of the cockpit. If you’d like to share the helm with the captain there is ample seating for three adults in the helm area. The front deck area provides a comfortable area for sunbathing and stargazing and wide louvres that serve to shade the salon interior, but which also function as a large wide seating areas. The transom offers wide steps for ease of maneuvering to and from the dock and dinghy and swim ladders provide an easy means of entering and exiting the turquoise-blue Caribbean waters. A hot water shower allows guests to enjoy a quick rinse off after a swim in the ocean. Two large coolers on the transom are fully stocked with your beverages of choice. Catamaran Starfish is very well maintained and offers all the amenities and services that discriminating charter guests desire. Why you should book Starfish! The cabin layout works for couples but this catamaran is also a great option for families with kids as the yacht has a lot of kid's toys and the crew raised their children aboard a yacht so they know what works! Reverse Osmosis drinking water additionally purified by ultra-violet light treatment. Starfish also has solar panels. Contact us for rates and current availability or to book a charter aboard Starfish!